Dr Deepak Chopra is a world famous "guru" who has written as many as 65 books but his hands don't appear to match! What is his real-life persona all about? The hands can tell us something about who Deepak Chopra really is. He has slightly thick fingers which are on the shorter side, the low-set Mercury finger, developed mounts and thick third phalanges seem at odds with his intellectual and spiritual persona. still a little different from what one would expect from someone like Dr Deepak Chopra. He does have well-developed mounts of Moon and Venus, and this shows his warmth, and outgoing nature. Check out photos of his hands here or here. 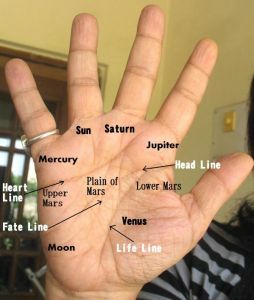 Some other features of his hand are the long Heartline and a conic Jupiter (index) finger. He has a good, long thumb, and a strong Saturn finger too. This suggests that this hand belongs to someone whose heart dominates his head, and in this sense, there is a lack of balance. An emotional person who takes major decisions based on his emotions and idealistic beliefs. He is a person for whom the heart would count above everything else, and at the same time, he is a serious, strong-willed personality. It is difficult to see the headline in the hand photos. This could be either because the headline is weaker, but cannot say for certain. The Headline could have explained how he thinks. It is safe to say that Deepak Chopra speaks with his heart. His lifeline, however, is very deep and well etched. Chopra would be able to channelize the emotions and ideas effectively. In other words, he would be able to use the heart qualities in a productive way. In addition, Chopra is a quick thinker and doer and has a superior planning ability. Dr Chopra's Mercury (little) finger, though low-set, is longer than average, and also conic-tipped, and the Mount of Moon quite prominent, and this is where his creative and expressive ability is shown. Chopra's hands also show a person quite without a desire to amass money or gain power through riches although a slight stingy streak is shown. At the same time, there is a love of comforts and some flashiness. The less palatable side of his personality as shown by the finger shapes, is that Chopra tends to be rather dominating and controlling, and is also very shrewd, with a desire for attention and fame. He may not be entirely straightforward. This does not take away from his belief in his message. At times these tactics are necessary marketing tactics. Overall, Dr Deepak Chopra's hand show him to be an effective leader, more so because he believes in a cause, although his dominant emotional side has its drawbacks. I don't know who this is, as I am not acquainted with the names of religious leaders! Is he popular in the west or in India? Writing 65 books is no mean task, I guess. He is very famous internationally, one of the many modern gurus. He is an Indian American and more popular in the west. He is very famous in the US, that I realised although not many in India have heard of him. It is interesting that you say he is a kind of self-help guru. I was not sure what type he was. Just saw him on an Oprah show once. so is he a humanitarian,a doctor,in true sense of the word? not close to being spiritual.Not everyone who speaks from the heart is spiritual. can you examine palm of an existentialist,say kafka? or one of the thakrey clan? or a person who very early on has lost his will to live? were you ever astonished,seeing someone's hand? I could not see signs of a true humanitarian on Chpora's hands, but often people do humanitarian acts nonetheless. In fact doctors are not usually humanitarians, but I have seen that at times businessmen are, like Bill Gates for example. At the same time a person who might be less of a humanitarian might do more humanitarian work so its best not to judge people. And I am willing to read anyone's hands, as long as I get decent hand photos of the person. Thanks for sharing your thoughts atlantis. You are right, it is the journey towards self knowledge that led me into hand reading. I was just 14 years old when it started. The nerd that I was, it was a time when I devoured all books, particularly those pertaining to philosophy, palmistry, numerology, hand writing analysis, psychic sciences and so on. Out of all these I found that palmistry is the most authentic and reliable.It's been a long journey and I think I am the wiser for it. What does the strong life line indicate on his palm? That he is well off health-wise? A strong lifeline shows vitality and energy and natural health. It will not necessarily show lack of disease, just that the basic biological force is strong.